Dates for his death year differ. Yosa Buson, or Yosa no Buson (与謝蕪村, 1716 – December 25, 1784), was a Japanese poet and painter from the Edo period. Along with Matsuo Bashō and Kobayashi Issa, Buson is considered among the greatest poets of the Edo Period. Buson was born in the village of Kema in Settsu Province (now Kema Ward in the city Osaka). His real last name was Taniguchi. Around the age of 20, Buson moved to Edo (now Tokyo) and learned poetry under the tutelage of the haikai master Hayano Hajin. After Hajin died, Buson moved to Shimo-Usa Province (modern day Ibaraki Prefecture). Following in the footsteps of his idol, Matsuo Bashō, Buson traveled through the wilds of northern Honshū that had been the inspiration for Bashō's famous Oku no Hosomichi (奥の細道 The Narrow Road to the Deep North). Buson published his notes from the trip in 1744, marking the first time he published under the name Buson. Buson married at the age of 45 and had one daughter, Kuno. From this point on, Buson stayed in Kyoto, writing and teaching poetry at the Sumiya. In 1770, he assumed the title of Yahantei (夜半亭), which had been the pen name of his teacher Hayano Hajin.
. . . BUSON - Cultural Keywords and ABC-List . . .
Buson was a famous painter and poet and there is a lot about him on the internet if you google. Here I will only present discussions that have come up about translations of his haiku.
. Reference - Books, Articles, external LINKS - . the sixteenth day of the first month by the solar calendar. In the solar calendar, year-end is in midwinter. The New Year by the lunar calendar, however, comes at the start of spring, which is one month later than in the solar calendar. The twenty-fourth day of the twelfth month of Tenmei 3 was actually close to the coming of spring. Buson used the name of "Shunsei" (Spring Star) as a painter during his early years in Kyoto. Here is what I try to teach my students. I tell them not to follow Master Soa's liberal attitude towards style but to seek out Basho's ideals of sabi and shiori and return to the haikai of olden days. --- That is the Zen of haikai transmitted from heart to heart. Only those who do not understand this would say I am a wretched sinner who has spurned his master's teachings. In 18th-century Edo Japan, the study of the Chinese classics was advocated by the Tokugawa shogunate and led to renewed interest in late Ming literary culture. One result was the development of the bunjin, gentleman-scholar, after the Chinese wenren. While the bunjin had to be well versed in the Chinese classics, calligraphy and poetry, painting was considered one of his accomplishments. The literati school of painting, bunjin-ga, also known as nan-ga, ‘southern school' of Chinese extraction, had a significant following. Its spontaneous brushwork and freedom of expression approached with high poetic content, found favour in the then kamigata area (present-day Kyoto-Osaka region), one of the first receptive to new artistic trends. Half a century earlier, the transition in the 1640s from Ming to Qing China had witnessed a considerable number of disaffected Chinese artisans leaving for Japan. Their entry was facilitated by the opening at the same time - during the Kan'ei era (1624-43) - of the port of Nagasaki to the outside world. Although their influence was limited, some minor Chinese artists managed to slip into the country, including one Shen Nanpin around whom a school in Nagasaki formed. The opening decades of the 18th century saw some highly individualistic painters call the former capital, Kyoto, home. They included Ito Jakuchu (1713-1800), an avid naturalist, Ike no Taiga (1723-76), noted for unconventional brushwork and Maruyama Okyo (1733-95), known for realism. 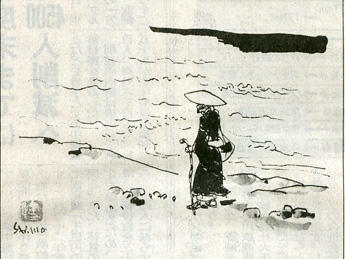 One bunjin drawn to the poetic tradition was Yosa Buson (1716-1784). He began life as a poet, was a monk and a master of haiku poems in the seventeen-syllable style long before he embarked on a career as a painter. Leading a peripatetic existence before settling in Kyoto, he was identified with the haiga, a genre incorporating the haiku poem and painting, which he perfected into an art form. Conversant too with the haikai, comic verses, he injected a sense of humour from his brush. He then studied the classical styles of the Chinese masters, and inscribed his literati painting with poetry as was fashionable. Experimenting with manifold styles, his work had eclecticism, yet it remained quintessentially Japanese. "That summer he [Buson] planned an ambitious project: he would force himself to write ten hokku each day over a span of one hundred days. The project was modeled on 'gegyoo', a program of intense training undergone by Buddhist monks for one hundred days in summer. Poetic gegyoo had been undertaken before by writers of haikai, notably by Kikaku, one of Sooa's [Buson's teacher; studied under Kikaku and Ransetsu] mentors. In 1690, in order to commemorate the fourth anniversary of his mother's death, Kikaku wrote one hokku each day for one hundred days and recorded the poems in a volume entitled "A Florilegium" (Hanatsumi). ... Buson planned doing a similar project at a more intense pace. There is no hard evidence to explain why he wanted to do the project at this particular time, but in view of the fact that a gegyoo is usually done in a special anniversary year, it has been speculated that 1777 was the fiftieth anniversary of his mother's death." According to Ueda, Buson's quoted hokku "suggests an invisible but vigorous force of nature that is carried by water to the roots of the trees. The vastness of the woods is conveyed aurally through the sounds of the waterfalls located at various distances from the poet." Ochi-kochi ni Taki no oto kiku Wakaba kana. Suzushisa ya Kane o hanaruru Kane no koe. An old woman looked at the scene and mumbled this to herself, im memory of her own spring. A Japanese website that suggests foreigners who cannot pronounce Japanese (which is to say, people who have not mastered the vowels of romance languages, for Japanese is more or less the same) might read this ku as "Some darling yeah, tiger on my knee, year nickel," and explains, with the help of Nifty (a company) on-line translation: "The river which early summer rain fell and continued and rose is flowing. Two houses build in front of the big river. It is the spectacle pushed at any moment." A glimpse at the original Japanese shows the last sentence means that there is a danger lest the houses be carried off at any moment. Maybe the BIG RIVER is the Yodogawa? to words cut in stone. A silk screen “sumi-e” painting by a renowned 18th century Japanese artisan was found more than 5,000 kilometers from home after disappearing 92 years ago. The Miho Museum here on Sept. 24 announced the rediscovery of “Shoku Sando Zu” (Images of the Shu roads), painted by Edo Period (1603-1867) haiku poet and artist Yosa Buson (1716-1784) in 1778. 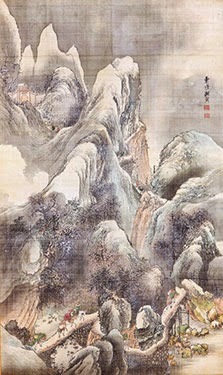 The work features massive mountains in the ancient Chinese state of Shu (current Sichuan province) in India ink and paint on a silk screen measuring 167.5 centimeters tall and 98.9 cm wide. 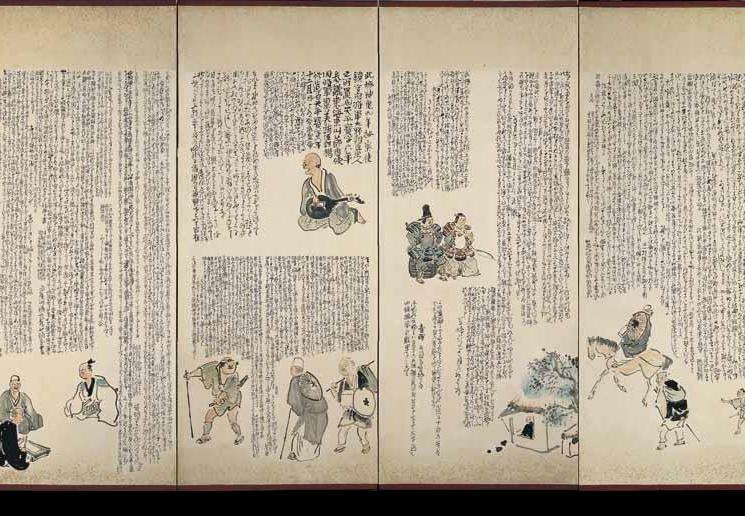 The painting was dubbed “the legendary masterpiece” when it disappeared from public eyes after being included in the art book “Buson Gashu” (Collection of Buson’s works) published in 1922. In 2011, it was learned that a company in Singapore owned the missing artwork. Upon examination, museum director Nobuo Tsuji and other curators declared the painting an authentic work by Buson. 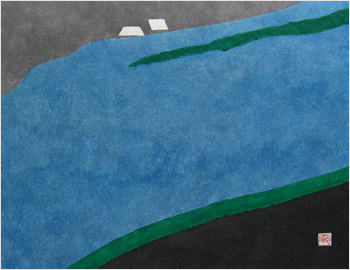 The museum plans to exhibit “Shoku Sando Zu” in summer 2015.
. kusa kasumi mizu ni koe naki higure kana . mist water evening . . .
. shira ume ni akuru yo bakari to nari ni keri .
. kiri hioke mugen no koto no nadegokoro . TENRI, Nara -- Amongst a collection of haikus held by the Tenri Central Library here are 212 previously unknown haikus by the Edo period poet Yosa Buson (1716-1783), announced the library on Oct. 14. The new discoveries join some 2,900 haikus by Buson that were known. The library says the new collection is called the "Yahantei Buson" haiku collection, and is thought to have previously been kept in the home of the Kyoto disciple of Buson, Teramura Hyakuchi. The collection was described in a 1934 edition of the magazine "Haiku Kenkyu," after which the collection went missing until it was acquired by the library around four years ago from a bookstore. The collection, divided by season, is organized into two books, one for spring and summer, and one for fall and winter. The collection is thought to have been put together between around 1770 and 1790. After a careful examination of the contents, the new Buson haikus were discovered among the 1,903 haikus contained in the collection. There were 57 new spring haikus by Buson, 35 for summer, 59 for fall and 61 for winter. They also had corrections and writings in black and red thought to have been added by Buson. One haiku, with "Bakemonodai" (monster topic) written before it, reads, "The umbrella changes form, a moon-lit night with eyes," and may have been created at a haiku gathering themed on monsters. Another haiku reads, "I am surprised by a burned field, flowering grass." Shinichi Fujita, professor of modern literature at Kansai University and a scholar of Buson, says, "Buson's haikus have been thoroughly studied, and it is amazing that a new collection of his works would appear. If the new works are compared against the many remaining letters of Buson, we may be able to learn when and against what background the haikus were made."
. Yoshiwake Tairo 吉分大魯 .
. Welcome to Buson in Edo 与謝蕪村 ! .
. Edo Haikai and Yosa Buson . My family and I visited konpuku-ji (it is mentioned in your article that Buson is buried there) in May. who has hung her thin robes? a page with Buson haiku and illustrations of dyed cloth. monk in the mist . . .